Dell’s Social Net Advocacy (SNA) program allows the company to digest thousands of online conversations and convert that data into actionable insights. Read more about SNA in this Forrester Groundswell Award Submission that highlights key aspects of the innovative program and how Dell has leveraged data insights to realize true business results. From the beginning, Dell has placed the utmost value on listening to customers, tailoring every service and solution to fit individual needs and paying close attention to customer feedback. Dell has always sought to build direct relationships with its business customers through focus groups, direct product quality data that comes from its tech support, externally published product and satisfaction rankings, surveys, and social media outreach. As Dell’s customers began to use social media to reach out to brands and discuss products, Dell created customized programs aimed at connecting with its customers through multiple social media platforms and creating numerous programs focused on connecting with customers online. But Dell was determined to take their customer listening program one step further by integrating voice of customer in all aspects of the business from marketing and operations in order to maximize business results and achieve more. Dell wanted to analyze and measure social conversations in order to measure brand advocacy, improve brand health and generate insights to generate business value. With so many social conversations (25,000 per day in English language alone) occurring on a daily basis, Dell needed to analyze the customer feedback in real time, answering questions such as: What are the emerging concerns and how significant are they? How should we prioritize decision-making? And how do we contextualize and quantify the insights in order to make intelligent business decisions. In order to realize these goals, Dell needed to address two key challenges, the first was to find a way to efficiently aggregate social conversations taking place daily about Dell and the competitive landscape in real time. Moreover, Dell needed to be able to intelligently understand, quantify, and contextualize the customer feedback. The second challenge was to measure the customer feedback in a way that gauged customer advocacy behind Dell and brand health. Dell joined forces with a leading text analytics provider to leverage sentiment and text analytics. Their patented Natural Language Processing (NLP) engine uses a mix of rules and dictionaries to break down and analyze customer feedback text, and to score it on an 11-point sentiment scale for added granularity and measurement. The sentiment and text analytics solution enables Dell to make sense of the vast amount of customer feedback data available. 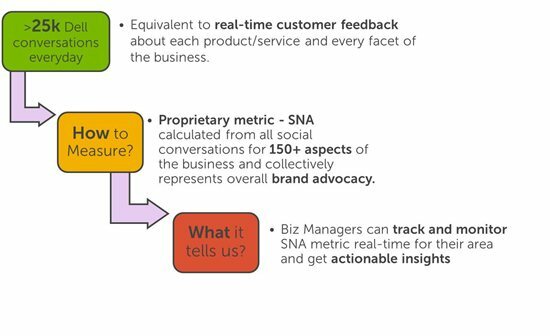 In order to make the insights relevant to Dell’s business and understand brand health through the voice of the customer, the Social Analytics team developed a proprietary metric, the SNA metric. This metric is an indicator of purchase intent, giving Dell a clear view into customer advocacy of the Dell brand. 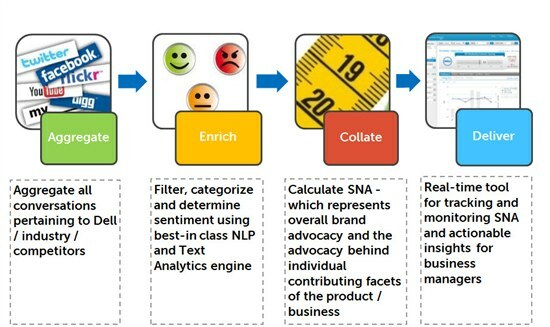 Once the social media data is collected, analyzed, and scored for sentiment, it is then scored against Dell’s SNA scale. Dell is at the cutting edge of turning social media conversations into actionable insights that can be used to make sure we are delivering the best services and products to our customers. The customer feedback derived from the SNA program is delivered across the entire organization, from departments such as customer care and quality control to marketing and product development. The real time analysis and measuring of social data has allowed Dell to proactively quell any public concerns before they grow into potentially larger issues. Moreover, Dell is able to add context to the sentiment and SNA scores such as understanding whether the customer is a brand advocate or not. For example, within hours after the launch of a specific Dell product, the Social Analytics Team saw a declining trend in SNA (decreased by more than 50%). When the analyst team looked further into the issue, they found a significant number of social media conversations expressing anger over the pricing for the new product. They turned to Dell’s Chief Blogger who quickly wrote a post explaining the situation and rectifying the price concerns. Within one day, Dell was able to return to original sentiment levels. Moreover, the general manager didn’t even need to be brought into the issue- employees are empowered to make quick and informed decisions. Dell is using this patent-pending software (SNA) and integrating it into all aspects of the business from Product Development, Marketing, NPS Diagnosis, Support/Customer Service, Sales and M&A. Measuring more than 1.5 million conversations annually, the system provides the ability to drill down to very granular parts of the business in real time. It serves as a source of uniform distribution and assimilation of customer feedback for multiple business functions. This enhances Dell’s avowed policy of customer centricity and direct feedback. And, since it updates in real-time, SNA accelerates customer feedback on important topics enabling shorter response cycles without negatively affecting the brand health.